Members of the Saucedo Elementary School community at a press conference last week. I am proud to say that members of my graduate program have decided to boycott the edTPA–a standardized exam for preservice teachers–joining in the battle against over testing, school closings and corporate reforms taking place around the city and country. 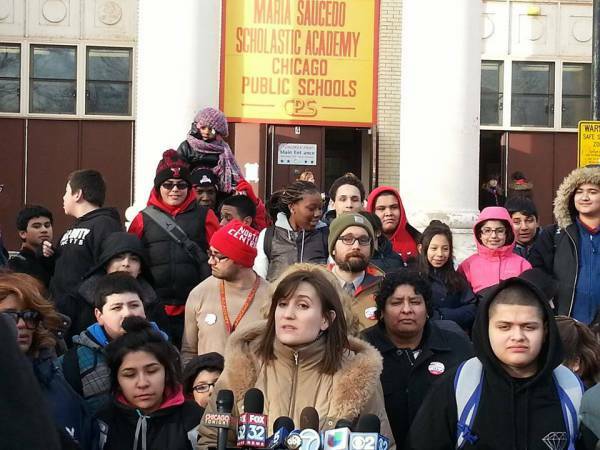 This last week, after 40% of its parents voluntarily opted their children out of the Illinois state test known as the ISAT, teachers at Saucedo Elementary School in the Little Village neighborhood voted to boycott the exam. They are holding fast to their decision despite threats from CPS officials that teachers from the school could have their certification revoked. As news unfolds, record numbers of parents around Chicago have opted their children out of the exam, and at least one more school has joined the boycott. Just weeks ago, interim dean of the College of Education at UIC Alfred Tatum announced that, without the input of any students or faculty, our masters program would be closing. Though we were shocked and discouraged, we also saw an opportunity to take an active stance in opposing the use of corporate assessments to shut down learning communities. This year, our Elementary Education Masters program, part of the College of Education at the University of Illinois at Chicago, was selected as a pilot program for an assessment known as the edTPA. Based on a fifteen minute video segment and a collection of writing prompts on lesson context, planning, and reflection, the edTPA markets itself as an authentic assessment of teacher readiness. Administered by the Pearson Corporation, the edTPA is poised to become a national assessment, potentially generating huge profits for the company. Claiming to ensure new teachers are prepared to enter the field, completing the edTPA could be required for all pre-service teachers in order to receive licensure in the future. – Student teaching assessments should take into account all aspects of a teacher’s practice. The edTPA forces candidates to adhere to a narrow, rigid rubric that focuses all efforts on the one lesson being tested, diverting attention away from the complex, long-term practice of teaching. – Student teaching assessments should support growth and learning throughout the candidate’s process. The edTPA operates on a pass/fail basis that offers candidates no feedback or support for improvement. – Student teaching assessments should promote opportunity for all candidates. The edTPA costs candidates approximately $300, and, as with all standardized assessments, will be biased against Black, Brown, poor, working and immigrant teacher candidates. – Student teaching assessments should be conducted by educators who are a part of the candidate’s learning community. The edTPA will be assessed remotely by temporarily hired educators who will be paid a flat fee of $75 to grade a 50 page document and 15 minutes of video. These hired educators have no connection to the communities in which we teach and learn. – Student teaching assessments should encourage candidates to teach in all schools, regardless of need. The edTPA discourages candidates from performing the assessment in high-need schools, where challenging classrooms may reflect poorly on the candidate’s score. While the edTPA purports to be a more authentic form of teaching assessment, we must reject and debunk this notion. For, ultimately, as with all forms of standardized assessment, the core assumption of the edTPA is that underprepared teachers and underworked students are the primary issues facing public education in the U.S. Being assessed more will not make us better teachers, just as it will not make better readers, writers and thinkers out of our students. Our universities, as with our elementary schools, become stronger when they are provided the resources they need, and when the capable educators within them are trusted to perform the duties they have sworn to carry out. We boycott the EdTPA because we believe as young teachers, and as members of our immediate communities, we know best what is needed to make our classrooms, our programs and our neighborhoods into the most effective spaces for learning they can be. We demand support in this process, and see this boycott as an active means of supporting ourselves and each other, as well as all pre-service teachers, long-term educators, and students who are working under the pressure of similar measures. Great post and statement! Do you have more information/links about the closure of the elementary ed program? Thank you for your support! At this point, the details of the “sunsetting” of our program are still vague. The administrators who made the announcement have given no real rationale for their decision, even after being respectfully confronted by students. The circumstances are very suspicious, especially since a Loyola masters program with similarly social justice oriented stance is currently being closed in a strikingly similar way to ours. There will certainly be more news to come, and we will keep you posted! Thank you for sharing the info and petition. Very disturbing. The economic plan to dismantle schools of ed–particularly those with outspoken political commitments–seems not even thinly-veiled. Excellent news from my alma mater! Your point by point analysis of the flaws of the edTPA as a performance assessment of teaching is really helpful to us in NYS as we build evidence of the flaws….even as graduates of my program (in elementary education) have to use it if they want to get certified in the state). We are already seeing some of our most highly skilled student teachers opting out of taking the edTPA and moving out of state. Next year it is to be tied to certification in Illinois, yes? Or is it 2016? By taking this courageous action you are helping build a movement where people can analyze the deep inadequacies of this Pearson for profit product. Sending solidarity and huge thanks. Thank you so much, your solidarity means everything. This has been and continues to be a collective effort by all members of our program, and we are glad if our research can be helpful in any way! I believe as the timeframe stands the edTPA will be required for certification in IL starting Sept. 2st, 2015. Many of our most key organizers and supports in this process have been undergrads and grad students who have yet to graduate, so we hope to continue on with this struggle in the College of Ed, even after we graduate. Keep strong NYS, and stay connected! It is wonderful to see another group of students speaking back to this corporate technocratic assault on teacher education. Each action opens more space for us to imagine and develop strategies for resistance. Sending love and solidarity! Thank you! Your story and analysis have been central to our conversation. Thank you for sharing and supporting us! paz, i was one of the organizers of the students of color speak program in the urban elementary ed undergrad program at UIC. we feel you, we are currently in the thick of the edtpa. is there a way we can connect? Of course! Big ups to all the organizers of that amazing event. It’s an honor to meet another student of color from the College of Ed! Some of the original organizers of our teach-in/boycott are from the undergrad program–folks I’m sure you already know–and we are trying to spread the word to involve the whole college. I’ll shoot you an email shortly and we could link up! yes i know who you are talking about :) please do – myself as well as others in the core group that organized would really be down to see how we can build together. This is awesome! All of the students at UIC have the solidarity and support of those of us in New York resisting edTPA. You actions are inspiring and encouraging. We are having a conference at Barnard this Saturday, I would love permission to share your statement in a panel discussion of pre-service teachers that I will be participating in. Absolutely, thank you so much!